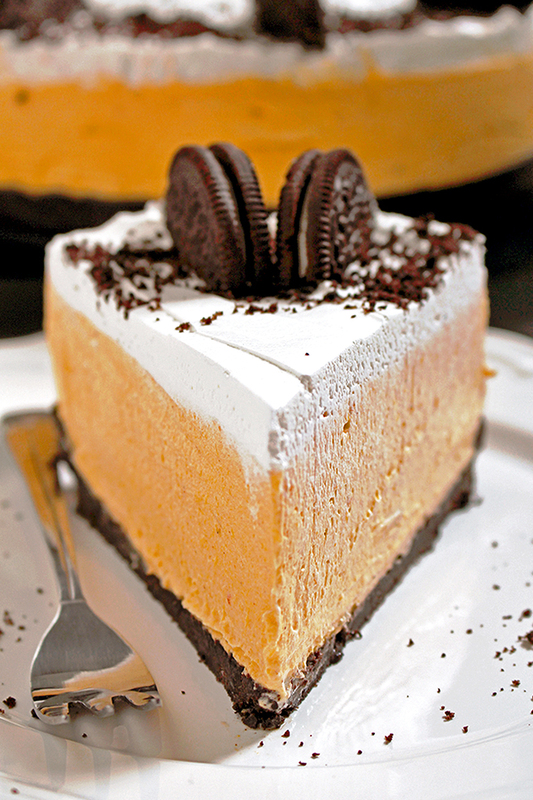 Easy No Bake Pumpkin Oreo Cheesecake so perfect for holidays and special occasions. 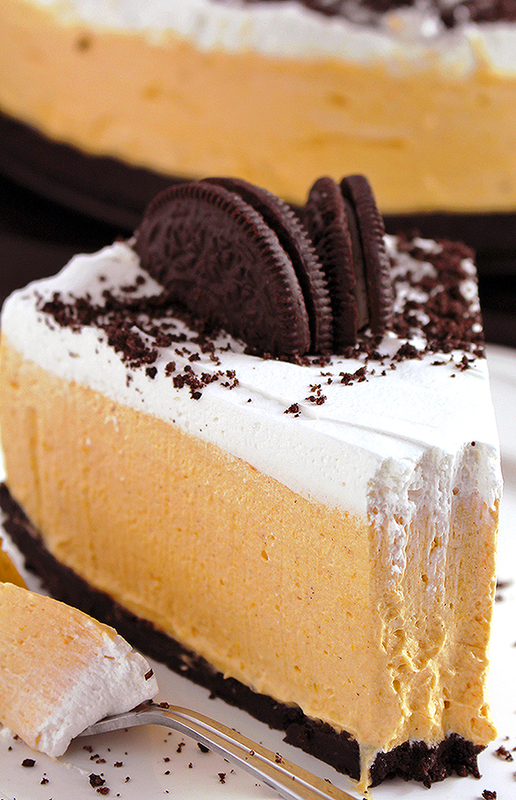 Oreo crust, rich pumpkin cheesecake filling and whipping cream topping. Great homemade festive dessert! I made another special dessert for pumpkin lovers. A great way to enrich your Thanksgiving dinner, which is planned for days, with patience and care. We try to make it as festive as possible and not to forget anything. You will enjoy a light dessert after a lavish dinner. After Pumpkin Sweet Spicy Buckeyes and Pumpkin Chocolate Cups present you No Bake Pumpkin Oreo Cheesecake. 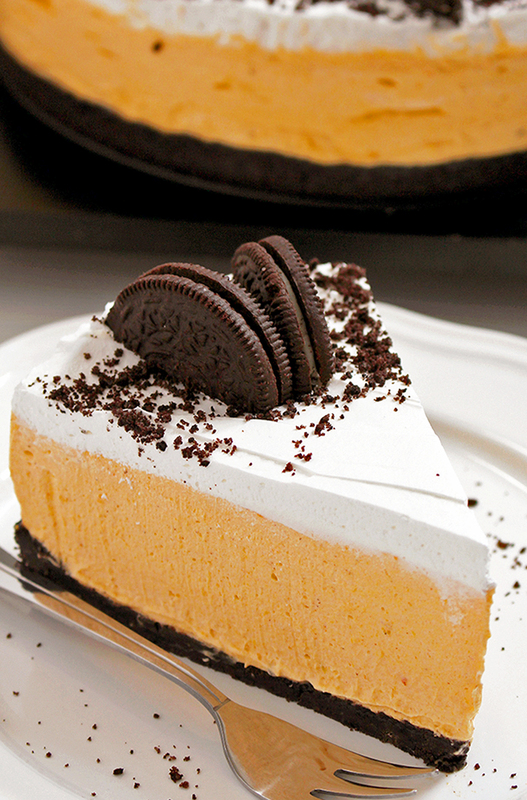 No Bake Pumpkin Oreo Cheesecake is just what you need. It is very light and delicious, easy to make and there is no bake. 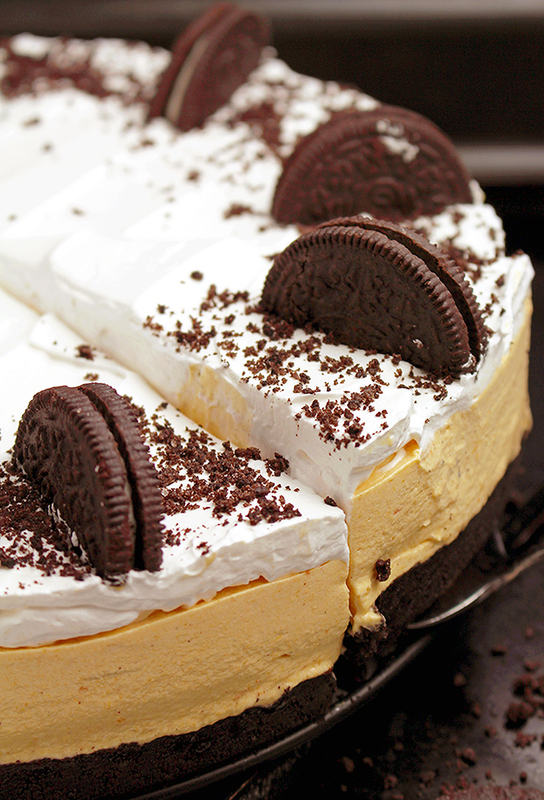 If you like pumpkin, you will like it, but if you like Oreo too, you ´ll love it. Crunchy layer made of Oreo cookies along with juicy filling made of pumpkin, cream cheese and whipping cream, with a touch of cinnamon and nutmeg… yummy. My family and me adore this dessert, my husband especially. Both, its taste and its looks, will make your Thanksgiving dinner, or some other special occasion festive. I know what I will make for Thanksgiving dinner, how about you? Pumpkin mania continues… More treats are coming soon. STEP 1 Make Oreo crust. Put Oreo cookies in a food processor, crumble it and then put in a medium bowl. Add softened butter and mix well. Place the mixture in a 9 inch springform pan and spread evenly. Set aside. STEP 2 Make cheesecake filling. Put cream cheese, sugar, cinnamon, nutmeg and vanilla in a medium bowl and mix them at medium speed for about 30 seconds. Add pumpkin puree and mix some more until well combined. Leave aside. Pour heavy cream in a large bowl and mix at lower speed for about 30 seconds, then at maximum speed for a minute and a half. Pour pumpkin and cream cheese mixture in the bowl with heavy cream and mix them well. Spread the mixture evenly on the Oreo layer. STEP 3 Make the topping. Put heavy cream and powdered sugar in a medium bowl and mix at a medium speed for about 30 seconds and then at a maximum speed for a minute. Spread evenly on the filling. Decorate with sprinkles and Oreo cookies. Keep refrigerated for at least 6 hours. It is best to be served the day after. 1 1/2 cup of heavy cream. Can I use cool whip instead of the heavy cream? Yes, you can try with cool whip. Softened butter or melted butter for the crust? I used melted unsalted butter for the Oreo crust.